I love walking in the wetland preserves at this time of year. Sometimes it is far too hot at midday, but if you go very early, just after sunrise, or late in the day, just before sunset, it is perfect! 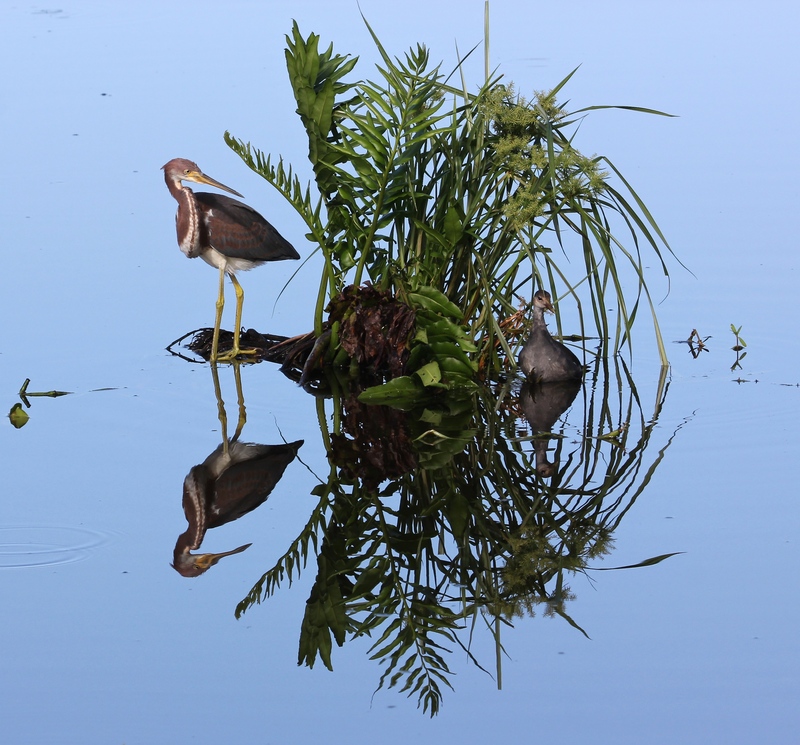 I spotted the Black-bellied Whistling Duck pair above recently, and discovered a plump young Gallinule intruding on this juvenile Tri-colored Heron’s leafy little shelter, on another early summer morning. Sometimes, the water is so still that the reflections are magical, like looking into a mirror. Sometimes, the sky is overcast – even threatening rainstorms – in the afternoon; that is just how it goes in the middle of summer here in south Florida. Even though it is way past the nesting season for most, I see many birds, like this female Anhinga watching the skies and listening alertly to every passing sound overhead, and precious chicks barely old enough to leave the nest, guarded by protective parents like this Common Moorhen and these Whistling Ducks. Usually, there are very few people out on the boardwalk, which makes these days wonderfully serene…! But there are always busy creatures keeping me company along the way. One very quiet evening, as thunder clouds were rolling in, I heard a repetitive little crunching noise in the watery plants below the walkway, and saw narrow, straw-like reeds breaking at the base and falling over. I assumed it was a baby bird rustling about, but no matter how I strained to see, there was no bird. What a delight to finally spy a Red-Bellied Turtle popping his head up above the water – chomping away on his supper of reeds and leaves in the hidden spaces among the rushes. This entry was posted in Birds, Marsh/Wetlands, Nature and tagged Anhinga, Black-bellied Whistling Duck, Common Gallinule, Tri-colored Heron. Bookmark the permalink. « Sometimes it isn’t about the birds . . .